For those not in the know, Joey Stuckey is an award-winning blind guitarist, songwriter, singer, composer, producer, radio and television personality, music columnist, educator and sound engineer. He is also the official music ambassador for his home town of Macon Georgia. Despite his physical limitations, Joey has flourished in every aspect of his life. He has released several albums, including Take A Walk In The Shadows (1995), Ironies, Pain And The Light That Guides (1999), Live And Stuff, (2000), Live And More Stuff, (2001), So Far, (2003), Oceanside, (2009), The Shadow Sound, (2011), Mixture (2012) and The Acoustic Sessions, Volume I (2014). Joey has also experienced national success with the launch of 'Mixture,' which reached #9 on the CMJ Top 40 Jazz Charts for North America. 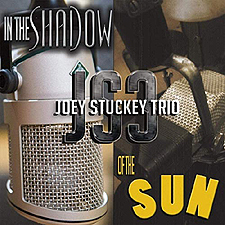 Joey's newest album In The Shadow of the Sun (out March 29th, 2019 via Senate Records, Inc.) is available for pre-order on both iTunes and Amazon Music, with the CD and VINYL versions of the album also including three (3) cover songs that are not available on the digital download versions! As the gentle reverb sounds out before quickly heading into the jangly blues rock guitar work that Joey is renowned for, 'You're So Wrong' (Album Version) resonates as the most perfect reveal for what to expect from the new nine track musical wonderment. The high flying, roaringly euphoric vibe of 'Ain’t It Good to Be in Love' featuring Al Chez, Howard Middle School Concert Choir & Darrel Hendricks just makes you want to play it in the car, top down on a hot summers day, whilst the downright, forthright, dirty gravel vocals of 'Troubles Come in Threes' (featuring singer-songwriter Randall Bramblett) continues to take you Down South for a hot and sweaty adventure. The loud and proud battle cry of 'Still Me, Sane & Free' is a brilliant mid-tempo sing-along whilst one of the other stand out cuts for me personally is the husky toned 'Truth Is a Misty Mountain' (featuring keyboardist Tom Rule). With the CD also adding all the songs again, this time as "mixes in magnificent mono," this now-18 track album is a keeper for anyone who admires and appreciates the Blues done right in todays modern age.